As heartwarming animal stories go, this one is a pip! On Monday, September 14, 2015, an Air Canada airline pilot made the decision to divert a Boeing 787 with well over 200 people on board to Frankfurt, Germany, in order to save the life of its smallest passenger before any harm could befall him. The international flight, emanating from Israel en route to Canada, made the emergency landing after the captain discovered a heater in the cargo bay was not operating properly midway into the flight. If you're wondering what that has to do with the jet's smallest passenger, that's because the passenger was a seven-year-old French Bulldog named Simba. Air Canada Flight 85 from Tel Aviv to Toronto started out routinely enough and was right on schedule when the pilot and crew were alerted to the heater malfunction down in the hold. Normally, this wouldn't have been a concern, except in this case there was precious cargo on board in the form of Simba, a native of Tel Aviv traveling with his owner to Canada. When it became obvious the problem wasn't going to rectify itself and it was only 19 degrees in the hold and they hadn't even reached the Atlantic yet, the captain made the decision to divert the flight to Frankfurt. As if 19 degrees isn't chilly enough, it seems the temperatures would continue to drop once the flight was out over open water. Potential customer complaints and cost aside, the captain wasn't about to take the chance with Simba's life. Once Flight 85 arrived in Germany, it was only a matter of time before Air Canada was able to find another passenger jet for Simba to hitch a ride on back to North America. As it turns out, Frankfurt is a hub for the airline and the pilot and crew knew they could find a number of homeward bound Air Canada jets that would be willing to take Simba aboard. Of course Simba's master was extremely grateful that his comfort and overall safety were taken into account and that the decision was made to put him on another flight. Like most pet owners, Simba is considered to be a beloved and irreplaceable family member by his "dad." The reason the pair were traveling all that way together is they are relocating to Toronto for academic opportunities, and Simba's dad couldn't imagine leaving him behind during his studies. According to the other passengers and the public at large, the pet friendly airlines made the right choice in accommodating the temperature-sensitive Frenchie. While this was a pleasant surprise, considering how grouchy fellow travelers can be at times, Simba probably wouldn't have fared well if the decision to land had been otherwise. Unfortunately, French Bulldogs are intolerant to temperature extremes. They get cold easily and overheat in an instant. 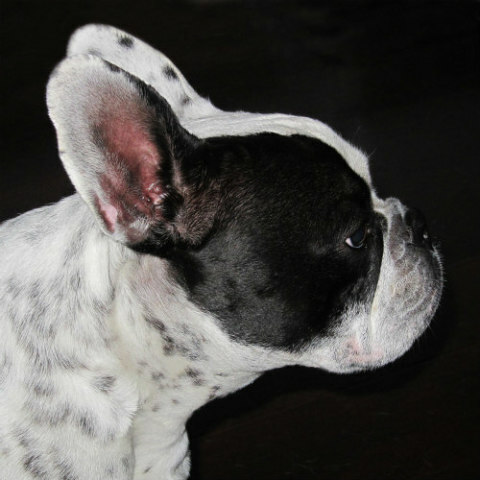 Either extreme could lead to a dire situation for the brachycephalic little breed known as clown dogs due to their distinctive look, amusing nature and sweet but goofy behavior. What they lack in heartiness they more than make up for with their endearing and hysterical antics. For anyone traveling with brachycephalic cats or dogs like these, be aware that they have special needs that should to be taken into consideration when making air and other travel plans. Taking the time to research your air carrier's policies for various scenarios may save your pet's life some day. In the meantime, hats off to the captain and the supportive passengers on board Air Canada Flight 85! You Do A Service For Your Country And Your Dog Is Proud To Show It!